Kids are the lucky ones. They know how to find a treasure when we are busy looking elsewhere. 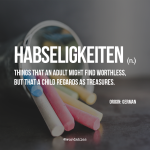 What is a habseligkeiten for you? As a kid it was an empty wooden cigar box. It seemed magical to me and I used to keep all my treasures in it. And unusual postage stamps, especially from other countries. Marbles. A rubber-band ball I made from thousands of rubber bands.